A couple of weeks ago I came across the concept of Korean BBQ and Mexican fusion in the form of the short rib tacos from the Kogi taco trucks in California. Combining the facts that I am really into both Korean and Mexican cuisine and that California is so far away I immediatly decided to try making the short rib tacos at home. Since there were no recipes available I set upon creating my own. I started with the kalbi or Koren barbecue short ribs which are short ribs that are marinated in a slightly sweet marinade until tender and then grilled until the sugars from the marinade caramelize infusing the ribs with an amazing flavour. Next up was the Koren style salsa roja which was responsible for bringing the heat to the tacos. I created the salsa roja by combining a chili de arbol salsa with some sesame flavours and a hit of gochujang, a Korean fermented chili paste. An onion and cilantro relish and some shredded romaine lettuce in a chili and sesame vinaigrette rounded out the tacos bringing some fresh ingredients to them. Now that I had all of the ingredients made all that was left was to assemble the tacos. This project (Project Kogi: Short Rib Tacos) took a bit of effort. After coming up with the recipes, making everything took a bit of time. The next time that I make these tacos I will make the salsa roja two nights ahead of time, marinate the ribs the night before, and make the relish and lettuce with dressing the morning of the meal. This way the only thing left to do is to pull everything out of the fridge, grill the ribs, assemble the tacos and enjoy. Despite the effort it was well worth it! The short rib tacos were absolutely amazing! The sweet and tender kalbi worked really well as a taco meat. The Korean style salsa roja added the perfect heat to the tacos along worth a ton of flavour. Feel free to pile this salsa on as it is really good! Come on, you can take the heat. 🙂 Seriously I was eating this salsa by the spoonful. The onion and cilantro relish combined with the seasoned shredded romaine lettuce added a nice texture, juiciness and freshness to the tacos and finished them of perfectly. Overall the tacos were nice and light and full of flavour and I practically inhaled them. Kogi also serves a bunch of other Korean/Mexican fusion dishes that sound really good. Stay tuned for more. I love Korean food. We had bibimbap for breakfast yesterday and Chap chae with Bulgogi for lunch but I've never tried it as a taco–very creative! I'm definitely going to have to give this one a try. I use to live in Korea and ever since I've moved, I have been forever craving new Korean food recipes. A masterpiece. Nice job, Kevin. Street food is definitely more complicated than handing over some cash! I might have to give this a try with tofu or something along those lines. I couldn't wait for this post! Now that it's all together, it looks AMAZING. NIce job on pitting the whole thing together. Definitely a great recreation of the famed LA Kogi taco. I'm sure your version tastes great and it looks amazing, too. I just had lunch, but I'm feeling like having a taco now. I just checked out Kogi's website. I'm not a big fusion fan but I think this is an exception! We eat Korean often at our home and I shop at the Korean Markets here in Atlanta but I have not combined Korean and Mexican…interesting:) Love the idea of combining the two. Kevin, you are amazing. I haven't had the Korean tacos, but I have no doubt that you nailed it! Kevin, these are beautiful! So impressed that you made everything from scratch. The whole thing sounds amazing. Great job and thanks for sharing! What a brilliant idea – you've combined two of my favourite foods! What an epic effort! I’ve gotta say, I love both Korean food and Mexican food, but (though I have heard of those Kogi tacos) I’ve never considered combining the two before. And why not? Everything tastes better in a wrap! WOW now this is some good eats Kevin!! It looks fantastic, Bravo to you for all your effort!! Oh my – these have my mouth watering! Gorgeous and scrumptious as always. I want to make everything I see on your blog! I am so glad that after all this work, everything came together! The final result looks delicious. Definitely a worthy undertaking. Now I'm pouting that there's no Kogi trucks in Kansas City however we do have plenty of short ribs so it looks like I'll be making my own thanks to your yummy recipe. Love Korean food, your taco look really delicious! Kevin that looks so yummy my mouth is droolin! your photo has me drooling, these look amazing! LOVE the combo of this dish! Totally worth the effort! Every time I come to you sight Kevin, my mouth starts to water. I've heard of the food truck! I'm definitely going to have to visit the next time I'm in LA! I love fusion dishes, esp. ones that involve Korean food. 🙂 The dish looks delicious, and I can't wait to try it! These Tacos look fantastic! Korean/Mexican fusion is something I have never thought of, let alone tried. I am eager to experiment with it now though! Oh my! These sound so good! Salivating now! Nice job, Kevin. Those look like they have the USDA 100% recommended daily allowance of AWESOME! I can't say much except that ever since I heard of the Kogi trucks, I have been dying to try this. The problem: I live on the east coast. The solution: this recipe. Thank you! I was reading this post when my husband looked over my shoulder, saw the picture and asked which taco truck it was from! High praise from him. Nice and yeah cooking by yourself can definitely lead to a bunch of rushing around the kitchen trying to assemble sauces, check on grills, another sauce that is going, etc. etc. My next stove will have the grill built into it. Nicely done and taco trucks rule. A great take on a taco…love this idea! Hope you like french cooking ! Have Amazing Day tasty Day !!! Wow, this looks so delicious. 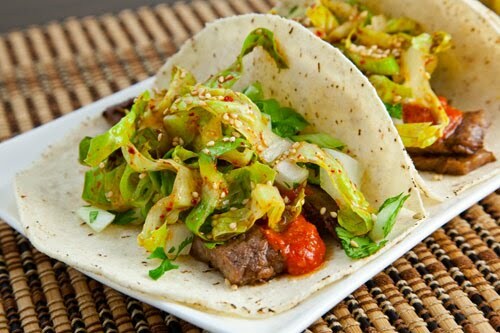 Love the flavors of Korean food and these tacos looks fantastic. Very clever. mmm… those look good! Love Korean short ribs. Great pictures! Your post reminds me to make tacos. I don't make them often enough. You really make an inviting plate! I've been trying to catch the Kogi truck since forever! Now I don't have to with this great recipe, thanks! It's lunch time and I wish I had a couple of those!! Nice job on the Korean tacos! I live in California, and those sound good. I've got to find one of those trucks you speak of. Thank you so much for going through the effort of making the recipes for the tacos! I am going to try to make the tacos soon! Hi Kevin! I finally got around to trying your Korean Taco recipe. I used some leftover Bulgogi. These may be my new favorite tacos! Thanks! I was really wanting some tacos tonight, but wanted them to be a little bit different. This recipe will do! we just made them! they were great! thanks for posting!